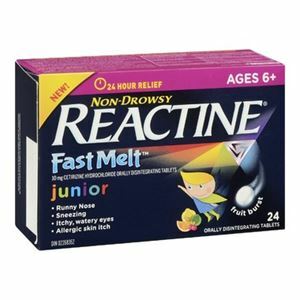 Reactine Fast melt Tablets are formulated specially for kids. These tablets are non drowsy in a nice fruity taste and provide 24 hour relief. These are suitable for children aged 6 years and above. Important features of Reactine tablets include that they provide relief from sinus symptoms and nasal congestion, watery and itchy eyes, stuffiness in the nose, sneezing, skin itching which is allergic and hives. For children above 6 years of age, recommended dosage is 1 tablet every 24 hours. Non Medical ingredients include ovidone, flavours, hydroxypropyl cellulose, magnesium stearate, mannitol, microcrystalline cellulose, sodium bicarbonate, sodium starch glycolate, sucralose.